Posted by Managed WordPress Migration User in Banking, Consulting, Finance , Followed with No Comments. “Disruption” is one of several trendy terms around the finance business. AI is going to disrupt this, FinTech is going to disrupt that and Blockchain or DLT is going to disrupt it all. The term also tends to be used in reference to an outsider coming in to upset the status quo and the incumbents. Trendy term or not, the outsiders are front and centre in this week’s post. Making it simple: using voice recognition to find out your bank balance. Great idea and one I could see being widely used. Amazon’s Alexa has been trying this out with a small bank in the US. This is simple and what I would see as a low risk function. It is just information and not as risky as say making a payment. You could easily imagine adding variations to say; a deposit was received to your account. What you allow, what you reveal will be a matter of philosophy. Swiss bankers will of course have kittens about banking secrecy; is Hans Schmidt asking about his account or the joint account with Mrs. Schmidt etc. The point though is, this is a useful thing to offer clients. Caveat: there are some dangers here. These voice recognition processes may struggle with regional accents. For some really good fun, try this video about a couple of Scotsmen trying to operate a voice activated lift. Helping the unbanked and offering choice: A wonderful article from Linas Beliunas on Amazon’s expansion into financial services deserves both a read by you and a mention from me. Amazon is letting clients deposit cash in local stores to power their spending and allowing local cash on delivery services too. Both of these are a boon for the unbanked; if you don’t have a bank account or credit card, in the past you have not been able to benefit from any good deals Amazon has had. You can now. My sense is that Amazon is playing the long game here. It is acting like a property developer who buys cheap land that is not designated for residential use, then lobbies and waits, with every chance of making it big when the zoning is changed. In fact, that might just happen for Amazon. In a November 8th speech, the Acting Comptroller of the Currency in the US suggested that research and analysis into allowing commercial companies to engage in banking activities would be a positive step. He sees a potential for more competition. Lobbying success or liberal thinking? Cash everywhere: As much as cash use is declining, it is still a necessity. But, providing access to it and dealing with it involves quite a bit of expense. In the UK, the Link organisation is looking at reducing the number of ATMs. Banks generally are trying to reduce the number of branches. It is a fair bet that two things ensue: costs for accessing or handling cash will go up and ATM coverage will go down. The further you or your business are away from large centres, the more this will impact you. If there were a means to make cash re-circulate without having to pass through a bank in the form of a deposit or an ATM, then we would be making a virtue out of necessity. A young start-up that I advise, SONECT, has come up with technology to enable just that. That tech enables any merchant or even an individual to be a virtual ATM. The business is based in Switzerland, where we are still attached to our cash. Here is the surprise; the team’s most recent prospects are outside Switzerland. Most interesting of the conversations is with a regional bank in very large state in the US; it makes perfect sense for a bank in a large, sprawling state to be interested in having its business clients able to pass on cash to customers rather than back to the bank and it makes sense to encourage retail clients to go to merchants, which will be business clients of the same bank, to get their cash. Encouraging retail clients into merchants has good social and business benefits. It re-enforces the local community and for the banks offers an alternative to an expensive ATM network and by slowing the ATM usage, it reduces the operating costs. SONECT is worth a couple of minutes of your time. The team has won many awards; last weekend they won a prize of CHF 120’000 in advertising and media support from Sat 1 in Battle of the Ideas. Innovation in banking and payments is being heavily influenced and driven from outside the banks. Bill Gates has been very forthright on this topic and it is a major focus for his foundation, albeit one that is aimed at helping the poorest. The point is that access to financial services is an important enabler. Amazon will do well for its stakeholders by enabling that access. Services like SONECT can contribute to local communities too. I am with that US official; allowing commercial organisations that are not banks to deliver some of these services will be a good thing. 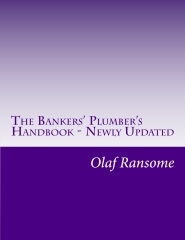 About the Author: The Bankers’ Plumber. I help banks and FinTechs master their processing; optimising control, capacity and cost. If it exists and is not working, I analyse it, design optimised processes and guide the work to get to optimal. If there is a new product or business, I work to identify the target operating model and design the business architecture to deliver those optimal processes and the customer experience. I am an expert-generalist in FS matters. I understand the full front-to-back and end-to-end impact of what we do in banks. That allows me to build the best processes for my clients; ones that deliver on the three key dimensions of Operations: control, capacity and cost. Are available on the 3C Advisory website, click here. Control in banks. How to do operations properly. For some in the FS world, it is too late. For most, understanding how to make things work properly is a good investment of their time. My book tries to make it easy for you and includes a collection of real life, true stories from 30 years of adventures in banking around the world. True tales of Goldman Sachs and collecting money from the mob, losing $2m of the partners’ money and still keeping my job and keeping an eye on traders with evil intentions. So you might like the tool kit, you might like the stories or you might only like the glossary, which one of my friends kindly said was worth the price of the book on its own. Or, you might like all of it. Go ahead, get your copy! An up to date view of the latest issues and how BCBS guidance that came into force from Jan 1 2015 will affect this area of banking. Kindle and hard copy.